According to the Federal Deposit Insurance Corporation (FDIC), as of March 31, 2016, there were 6,122 FDIC insured financial institutions in the United States. Of those 6,122 commercial banks and savings associations, 4,701 did not hold any derivatives. To put that another way, 77 percent of all U.S. banks found zero reason to engage in high-risk derivative trading. Citigroup, however, the bank that spectacularly blew itself up with toxic derivatives and subprime debt in 2008, became a 99-cent stock during the crisis, and received the largest taxpayer bailout in U.S. financial history despite being insolvent at the time, today holds more derivatives than 4,701 other banks combined which are backstopped by the taxpayer. 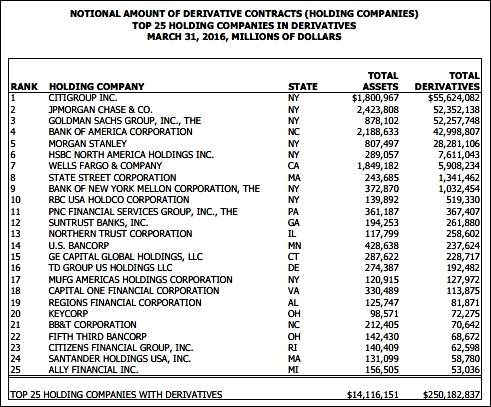 The total notional amount of derivatives sitting at Citigroup’s bank holding company is $55.6 trillion according to the March 31, 2016 report from the Office of the Comptroller of the Currency (OCC), one of the regulators of national banks. (See chart above.) Out of Citigroup’s total notional (face amount) exposure of $55.6 trillion in derivatives, $52 trillion of that is sitting at its insured depository institution, Citibank, which is still decidedly too-big-to-fail and would require a taxpayer bailout again in a collapse. If you add in four other mega Wall Street banks (JPMorgan Chase, Goldman Sachs, Bank of America and Morgan Stanley) to Citigroup’s haul in derivatives, there is a staggering $231.4 trillion in derivatives or 93 percent of all derivatives in the entire FDIC banking universe of 6,122 banks and savings associations. Didn’t the Obama administration tell the public that allowing these Frankenbanks to continue to gamble in derivatives while putting the U.S. economy and taxpayers at risk was going to end under his Dodd-Frank financial reform legislation passed in 2010? How could there have been meaningful reform of Wall Street if Citigroup and these other four banks are still holding a loaded gun to the taxpayers’ head? Under the “Push-Out Rule” (Section 716 of the Dodd-Frank Wall Street Reform and Consumer Protection Act), insured banks were not going to be allowed to hold these derivatives when the rule was fully implemented in July 2015. The mega banks would have to “push-out” the derivatives to their uninsured affiliates so that the taxpayer wasn’t on the hook for future losses or bank implosions. But in December 2014, Citigroup was able to slip language into the must-pass spending bill that effectively repealed this critical Dodd-Frank provision and President Obama signed the bill into law. According to OCC data, prior to Citigroup’s massive bailout in 2008, it held $41.3 trillion in notional derivatives as of March 31, 2008. Instead of regulators forcing the unruly bank to pare back its exposures, its tally today of $55.6 trillion shows it has been allowed to grow its derivative risks by 35 percent. According to the General Accountability Office, this is how much Citigroup needed to remain afloat the last time it blew itself up: On October 28, 2008, Citigroup received $25 billion in Troubled Asset Relief Program (TARP) funds. Less than a month later, it was teetering again and received another $20 billion. But its capital moorings were so shaky that it simultaneously needed another $306 billion in government asset guarantees. And all of this disclosed money spigot came on top of the Federal Reserve secretly funneling to Citigroup over $2 trillion in cumulative loans over more than two years at interest rates frequently below 1 percent. The counterparties to this mass gluttony in derivatives by the mega Wall Street banks included the two government sponsored enterprises, Fannie Mae and Freddie Mac, and the large insurer, AIG. “AIG received a taxpayer backstop of $185 billion and had to be taken over by the Federal government. But the bailout of AIG was in reality a backdoor bailout of the biggest Wall Street banks and their foreign big bank kin who had used AIG as a counterparty on their casino-like derivative bets and for securities loans that AIG could not make good on. The banking crisis and economic collapse in 2008 was the largest financial disaster in the United States since the Great Depression. To understand that the Obama administration and the U.S. Congress have not only failed to rein in the risks of a recurrence but have actually allowed the risks to dramatically grow, is an indictment of our entire political system and a siren call for the political revolution that Senator Bernie Sanders has now surrendered to the Clinton Wing of the Democratic Party — otherwise known as the Wall Street Banksters.